Aries - At some point this week you will find yourself wanting to write a book. You'll open up a word processor, type out some words, sigh, and then give up. Taurus - Your laziness will cause you to use your cell phone as a bookmark. Again. Gemini - You've had a book in your TBR pile that's been on your mind recently. It's time to read it. Cancer - Sometime this week your finicky ways will cause you to start a book, get 30 pages in, and then start reading something else. Leo - Sometimes you fantasize about fighting alongside Katniss Everdeen in the Hunger Games only to realize that you'd be dead in the first five minutes. Virgo - You want to start a reading project soon. Maybe read a few classics. If you do this be aware that you'll use Wikipedia a few times for plot summaries--there is no shame in this, Virgo. Libra - Dear Libra, do you really have to "rescue" a used copy of a book you already have? Leave it on the shelf for someone else. Scorpio - People notice that you use perfect grammar and punctuation while texting. Be proud. Sagittarius - Anger washes over you when you hear someone exclaim "I'm reading an audiobook right now!" You can't read an audiobook... Let it go. Capricorn - You'll find yourself thinking of that book you loaned out years ago that you never got back. Maybe it's time to take a trip yourself? Aquarius - Out of boredom you'll find yourself writing tacky blog posts. 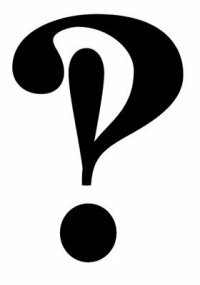 Pisces - No one will ever love the interrobang as much as you do. I've never read horoscopes before so I had to look up which one is me. Awesome or nerdtastic? I'm scorpio. Perfect grammar and punctuation: Texting, almost always YES. Tweeting, not so much. Really? You've never read a horoscope? Ever!? Asheley- I'm with you. I'm a scorpio that does use proper grammer/punctuation when texting. It is IMPOSSIBLE to do on twitter unless you want each message to consist of 5 tweets. I can never use proper ANYTHING on Twitter. Drives me up a wall. Wow, all these comments are from Scorpios! Me included. I do tend to use proper grammar and punctuation but I also lax into chatspeak A LOT. So I guess it's a give or take! Apparently everyone who reads this blog is a Scorpio. Weird. OMG, I'm a Leo and that is totally right. I came to terms a long time ago I'd probably die pretty easily in the Hunger Games. That's why I was never like "I'm from District whatever". You don't want to be a district because if you are you will probably die. I think we'd all die. I think I'd last more than the first day, though. Maybe three days. Awww. Screw it. I'd be shot with an arrow within the first three minutes. Yep. I think some of my blog posts are tacky. But I still enjoy them. Is it bad that most of these apply to me except mine? I'm a Pisces and I've never watched Interrobang! Fun post anyways though, what a clever idea! qu'il serait obligé est située à.
arriver à et aurait été littéralement.